Irish quarterly PMIs for 3Q 2015 posted a marginal improvement in growth conditions compared to 2Q 2015, further strengthening on the already fast pace of economic activity expansion. This overall momentum was driven solely by gains in growth momentum in Services sectors. Manufacturing PMI averaged 55.2 in 3Q 2015, down marginally on 55.8 in 2Q 2015 and marking the slowest pace of activity expansion since 1Q 2014. 3Q marks second consecutive growth of weakening PMIs. Still, current running rate signals strong growth in the sector. Services PMI posted a reading of 62.8 in 3Q 2015, up on already high reading of 61.8 in 2Q 2015. This is the highest reading since 2Q 2006 and marks second consecutive quarter of increases in the index. Overall activity signal from the 3Q PMI averages is for an outright boom in the sector. Construction PMIs (with data only for July-August) fell in 3Q 2015 to 59.1 from 2Q 2015 reading of 62.1. Nonetheless, growth, as singled by PMI, remained robust in 3Q 2015. 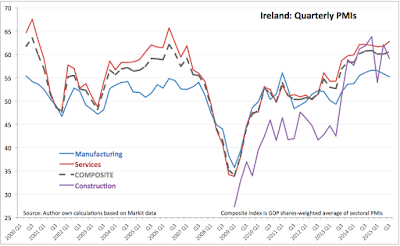 The post 7/10/15: Irish economic Activity & PMIs: 3Q 2015 appeared first on Silver For The People. This article was posted in economic activity and tagged Uncategorized. Bookmark the permalink. Follow comments with the RSS feed for this post.Comments are closed, but you can leave a trackback: Trackback URL.